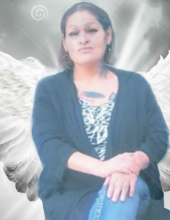 Emily Aguilar Grimaldo, 40, of Stamford, passed away Monday, February 4, 2019 at her home. Funeral services will be held 10:00 a.m. Friday, February 8, 2019 at Kinney-Underwood Funeral Chapel with Pastor Paul Wright officiating. Burial will follow in Highland Memorial Cemetery. Visitation will be held from 6-7 p.m. Thursday, February 7, 2019 at the funeral home. Emily was born on February 15, 1978 in Sweetwater, Texas, the daughter of the late Ben Acosta and Elodia Aguilar. She loved spending time with her children and other family members. Emily also liked toing to the game room and cooking tamales. Emily was preceded in death by her grandparents; her parents; and one brother, Gilbert Aguilar. Surviving Emily are her children, Michael Grimaldo of Sweetwater, Makayla Grimaldo of Munday, Daniel Aviles, Bianca Aviles, both of Stamford; sisters, Cristina Aguilar, Mary Aguilar, both of Haskell, Yolanda Ramos of Austin, Diana Ramos of Stamford; a brother, Manuel Ramos of Stamford; three grandchildren; numerous aunts, uncles, cousins, nieces and nephews; and a special friend, Moises Garcia. To send flowers or a remembrance gift to the family of Emily Aguilar Grimaldo, please visit our Tribute Store. "Email Address" would like to share the life celebration of Emily Aguilar Grimaldo. Click on the "link" to go to share a favorite memory or leave a condolence message for the family.